We are a member of The American Baptist Church of Massachusetts, which is associated with The American Baptist Church of USA. We believe in the power and authority of the Bible and One God in three persons (three appearance) – Father God, Jesus Christ, and Holy Spirit. We believe anyone can be born again as God's child by believing and confessing Christ as the Savior, which is possible by the work of the Holy Spirit. We encourage the believer (Christian) to practice the love of Christ, read the Bible, and experience some form of spiritual awakening in our daily life. In the fall of 1870, several residents of Wollaston Heights obtained the use of a hall in the Wollaston Hotel to hold worship services. In 1871, 23 people met in the home of George F. Pinkham to draw up a Declaration of Faith and appointed a committee to plan to construct a place of worship. 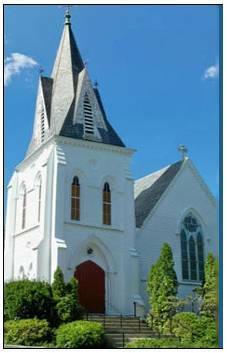 The first worship in the new building was held on December 31, 1872, where the present structure still stands. We are the servants of the First Baptist Church of Wollaston, Quincy, MA. If you have any questions about the Christianity, Sunday School, Choir, and the building usage, please contact us at your convenience. Our church office hour is Tue - Fri at 9:30 am - 5:00 pm.